NASA's Galaxy Evolution Explorer has discovered a galaxy tail studded with bright knots of new stars. The tail, which was created as the galaxy IC 3418 plunged into the neighboring Virgo cluster of galaxies, offers new insight into how stars form. "The gas in this galaxy is being blown back into a turbulent wake," said Janice Hester of the California Institute of Technology in Pasadena, lead author of a recent study published in the Astrophysical Journal Letters. "The gas is like sand caught up by a stiff wind. However, the particular type of gas that is needed to make stars is heavier, like pebbles, and can't be blown out of the galaxy. The new Galaxy Evolution Explorer observations are teaching us that this heavier, star-forming gas can form in the wake, possibly in swirling eddies of gas." Collisions between galaxies are a fairly common occurrence in the universe. Our Milky Way galaxy will crash into the Andromeda galaxy in a few billion years. Galaxies tangle together, kicking gas and dust all around. 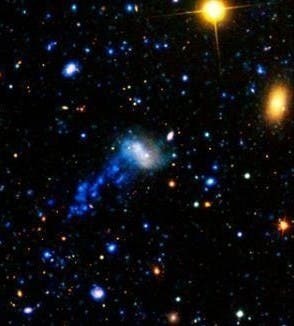 Often the battered galaxies are left with tails of material stripped off during the violence. Hester and her team studied the tail of IC 3418, which formed in a very different way. IC 3418 is mingling not with one galaxy, but with the entire Virgo cluster of galaxies 54 million light-years away from Earth. This massive cluster, which contains about 1,500 galaxies and is permeated by hot gas, is pulling in IC 3418, causing it to plunge through the cluster's gas at a rate of 1,000 kilometers per second, or more than 2 million miles per hour. At this incredible speed, the little galaxy's gas is being shoved back into a choppy tail. The astronomers were able to find this tail with the help of the Galaxy Evolution Explorer. Clusters of massive, young stars speckle the tail, and these stars glow with ultraviolet light that the space telescope can see. The young stars tell scientists that a crucial ingredient for star formation — dense clouds of gas called molecular hydrogen — formed in the wake of this galaxy's plunge. This is the first time astronomers have found solid evidence that clouds of molecular hydrogen can form under the violent conditions present in a turbulent wake. "IC 3418's tail of star-formation demonstrates that strong turbulence promotes cloud formation," said Mark Seibert, a co-author of the paper and a member of the Galaxy Evolution Explorer science team at the Carnegie Institute for Science in Pasadena. Hester added that galaxy tails provide the perfect environment for isolating the factors controlling star formation. "These tails are unique, exotic locations where we can probe the precise mechanisms behind star formation," said Hester. "Understanding star formation is pivotal to understanding the lifecycles of galaxies and the dramatic transformations that some galaxies undergo. We can also study how the process affects the development of planets like our own." Graphics and additional information about the Galaxy Evolution Explorer is online at http://www.nasa.gov/galex/ and http://www.galex.caltech.edu . Casey Kazan via NASA/Jet Propulsion Laboratory.